General Studies or General Knowledge is what many of us are always interested in and obviously for several reasons– from having a take at TV game shows like KBC (Kaun Banega Crorepati) to aspiring for success in civil services examination or for just staying informed as good students of current affairs and participate in engaging conversations. GK is fascinating in quiz form for students of all genre. However, those preparing for competitive exams have to take it very seriously to top score! And quite obviously, there are dozens of books and handbooks in the marketplace besides the whole cyber space on your screen. If examination time is the art and science of managing time, then choice of study material becomes very important factor. 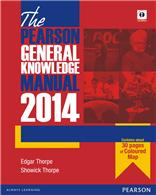 And the just released Pearson Concise General Knowledge Manual 2014 edition in that sense fulfils many criterions. It is concise, well-presented and illustrated and uses a readable language. One doesn’t get bored reading about the most dreaded subjects. It’s easy to follow structure and layout are welcome from a student point of view, who has to mug up so much information for succeeding in competitive examinations. The handbook may have been updated and revised but every printed book has a cut off date and on that count, one may need additional source of information for purely current affairs of last six months. For everything else, this book is a perfect gift. Coming from a company that is speedily developing test-prep solutions, the manual is indeed a well-researched and examination oriented study material for General Studies. It also contains 1500 MCQs (multiple choice questions), which should offer a great practice time for all our friends preparing for competitive examinations where GK scores count. While handbooks like the one, we discussed are helpful, we would advise students to be actively involved in reading newspapers, current affairs magazine and TV/Radio news. This a good habit in the long run.